I sent a thank-you note to my therapist last week. I hadn’t seen her in more than a decade, but recently found myself reflecting on my time with her and feeling appreciative of the help she gave me in figuring out some important things that gave my life new direction. The words came easily. So much of what I’m grateful for in my life today stemmed from those crucial sessions with her. My smart phone, iPad and laptop have become my BFFs lately. I use them for practically everything I do. But writing the note by hand to my therapist was a must for me. I’ve become pretty intentional with thanks in the past 10 years. The act of sitting down with a blank card and a nice pen to thank someone for something – anything – has become an experience I crave. Part of it stems from the feeling I get from receiving a thank-you note. I don’t write my notes in hopes of getting thanked back. And I’m not upset when I don’t receive a thank-you note for some thing or act. But I know how they make me feel when I do receive them. And I like passing that feeling on to someone else. During our recent vacation up north, we sat around the campfire with friends, catching up on life. Our friend Ruth told the story of a letter she’d received from her daughter and three of her daughter’s childhood friends. The four women, now adults with children of their own, had gotten together after some time apart and were talking about the influence each of the other’s parents had on their lives. The women decided to write a group thank-you note to their four moms. They included a picture of themselves now, and each woman wrote a few lines to each mother about something she did that left an impression or led to a tradition in their own family. You can imagine what that meant to Ruth and the other mothers. Ruth’s story stood in stark, sad contrast to the recent death of a terrific teacher I had at East Lansing High School. Howard King was a gentle, kind-yet-firm teacher. He was funny and had a great way of bringing world cultures – and his passion for them – to life. When I heard of his passing, I found his obituary and guest book online. It quickly filled up with memories and thanks from students Mr. King had touched in his decades in the classroom. And while I enjoyed reading the stories people shared, I couldn’t help but be sad that Mr. King never got to read them. When I started looking around online for stories about thank-you notes, I was disappointed to find my Google search top-heavy with pages and pages of search results devoted to writing notes to thank people for job interviews or presents. Those notes are important, of course. But I wanted to find people who thank others for more personal reasons. 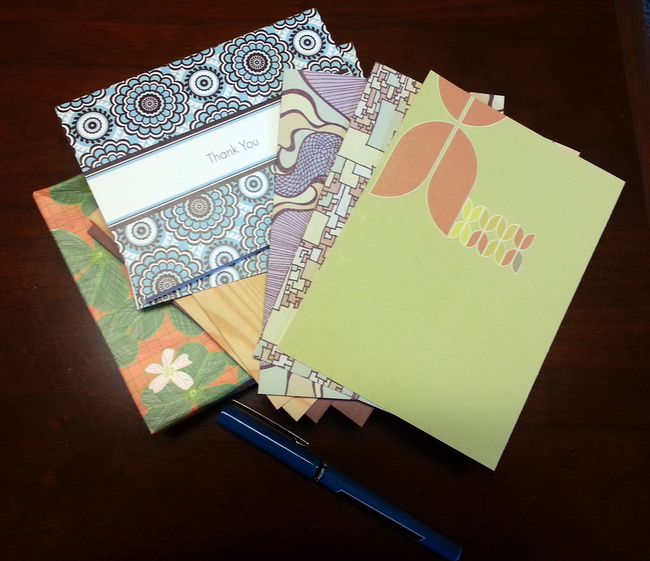 Digging a little deeper, I found some people turn thank-yous into year-long projects. Others make jokes of them. Some sing their thanks. Famous people have written their fair share of thank-you notes. My thanks come in waves, often after I’ve seen something go wrong in someone else’s life and I think about how grateful I am. I write them for important things — I sent a note to President Obama thanking him for inviting my friends to the White House to celebrate Father’s Day. And I try to remember to write thank-you notes for happy, even silly reasons too. I’ve thanked people for being awesome. Reflection is a beautiful thing. When you can step back from whatever chaos may be whizzing around you at the moment and really think about what you’re grateful for, you’ll find there are plenty of people to thank. Try it. It just might become a habit. Robin Miner-Swartz is the vice president of communications for the Capital Region Community Foundation. She’s a #lovelansing cheerleader and bleeding-green Spartan who never met a cup of Biggby coffee and a spinach and feta omelet she didn’t like. I have always loved sending handwritten notes. People act so pleased and surprised when they get them. Thank you Robin for reminding us of a simple way to touch the lives of those we care about. I was one of those friends that wrote the thank yous to our parents. We had so much fun doing it. Thank you, Robin, for sharing our story. The 5 of us had been best friends in grade school and had not been all together since the 8th grade. We are late 40's now & it was like we had never been apart- so many great memories & so much to be thankful for. Our parents were great influences. Too many times, people don't appreciate that or acknowledge that. I wouldn't have these great friends if it weren't for each of their parents. Shortly after our trip, one of our fathers passed away. I was so glad that I was able to talk to him on the phone during our trip & grateful that they had received our card before he passed. He was like a second dad to me while I was growing up. I'm glad I was able to tell him that before he passed. Lori, thanks so much for commenting. I was so grateful to hear Ruth tell the story of the letters you all wrote. What a gift for everyone involved!